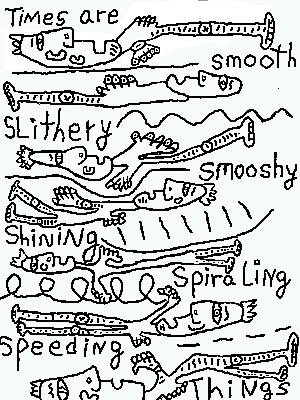 TIMES are smooth, slithery, smooshy, shining, spiraling, speeding things. Are Times way stations of TIME? H.
There isn't time. But I'm having fun playing with it anyway. I agree that time seems to stop sometimes, and then other times, seems to go very very fast.